Last winter I started a little landscape renovation project at my house. This patch of woods along my driveway wasn’t that pretty. There were a lot of invasive foreign plants like Norway maples, bush honeysuckle and multiflora rose, and many of the trees were mutilated by the power company because of the overhead wires. 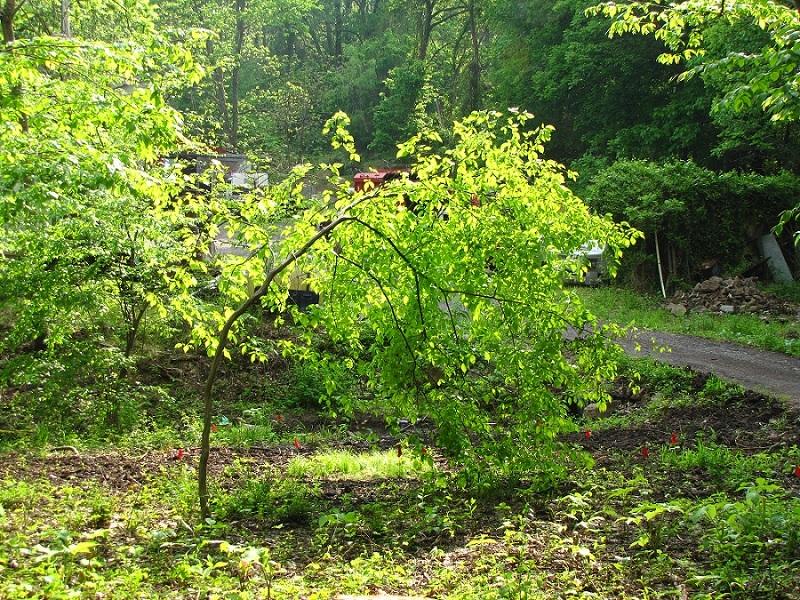 So I cleared away a lot of that stuff, and just left some of the nice understory trees like the dogwoods, blackhaw, and hophornbeam. I’ve replanted with wildflowers and intend to add some nice native shrubs. It looks nicer already, and now you can see the creek. Some of the little hophornbeam trees that I left are tall and skinny because they’ve been in competition with the adjacent trees their whole lives. Today, I noticed that after last night’s rain, this tree is bent over. That’s because when trees are crowded they can’t sway in the wind. That movement is what causes a tree to develop a strong, tapered trunk. Strong lignin bonds develop in the tree’s xylem as a reaction to bending. When you buy trees in a nursery, the size of the tree is measured by caliper (except smaller trees). Caliper is the trunk diameter at a half a foot above ground. If you have the choice between a taller or shorter tree of the same caliper at the same price, you want to pick the shorter one. Its more tapered trunk will be stronger than the other tree’s. This is also why we try to avoid staking newly planted trees. If they must be staked we do it in such a way that the trunk can still bend in the wind.